M45 Hp and Tq estimates? - Miata Turbo Forum - Boost cars, acquire cats. I've got a 2000 that has been running a JR M45 for several years. Over the years, I have replaced stock parts with: 4:1 header, full 2.5 in. RoadsterSport3 exhaust, fully enclosed DDMWorks Intake. I am planning on adding a MS, but am still currently running the JR magic black box. What kind of Hp/Tq difference should I expect from stock with my current setup? Would my system safely cope with a smaller nose pulley (62.5mm)? If so: How much will this affect boost (1-1.5 psi? ), how would this affect Hp/Tq? What kind of difference would a MS make as far as my numbers? I understand the gains will be minimal, as there is no major changes being made. "I am planning on adding a MS" > "4:1 header, full 2.5 in. RoadsterSport3 exhaust, fully enclosed DDMWorks Intake." Thanks Jeff, just who I was hoping to hear from. I assumed the MS would help out immensely, I was just trying to get familiar with all of it first. Would my current system accept the smaller nose pulley? 94 1.8, M45, 62mm pulley, stock manifold, 2.5" borla, high flow cat, stock injectors, low fuel pressure, o2 clamp and p-p-p-p-powercard!! 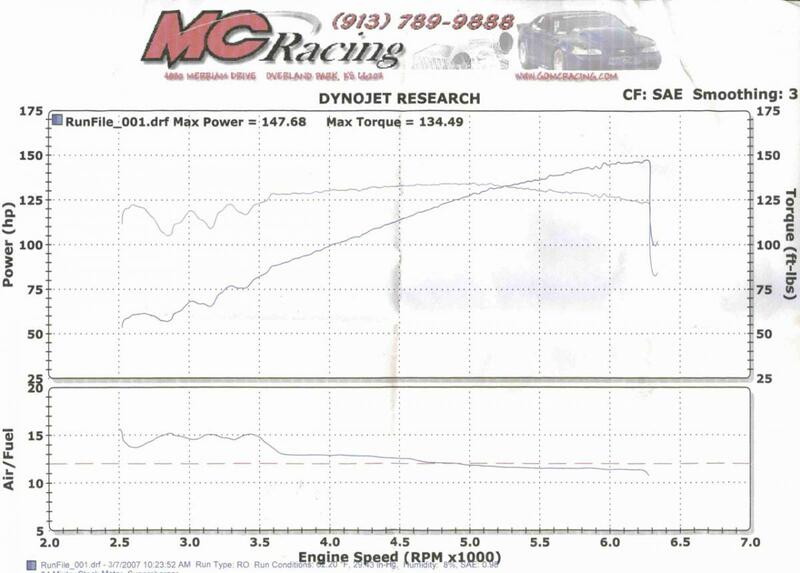 We did a little tuning after those 2 runs but I can't find the dyno sheet, all it did was smooth out the dip at 4000 and improve the fuel delivery. Injectors were running at near 100% and the stock fuel pump died shortly after. If IIRC final numbers were 164hp/147tq. I tuned a m45 setup after he ran on the crapcard and the difference was big everywhere. I'm pretty impressed with the power of your n/a car, man! My '92 1.6 made 140.hp on a Dynodynamics dyno. They typically read 10%~15% lower than a dynojet. This would extrapolate to 155~160 whp. I am running a small pulley and make about 9 psi. I run with 1.8 tan injectors and AFPR as well as a JR boost timing control box. I just got a LINK for mine so I expect to get rid of the AFM which supposedly lets you make another 10 or so HP. The Link should allow for much better fuel and timing tuning so there should be some gains there too. I suspect that going with a MS you will see a substantial improvement because of the tuning ability and the deletion of the AFM. 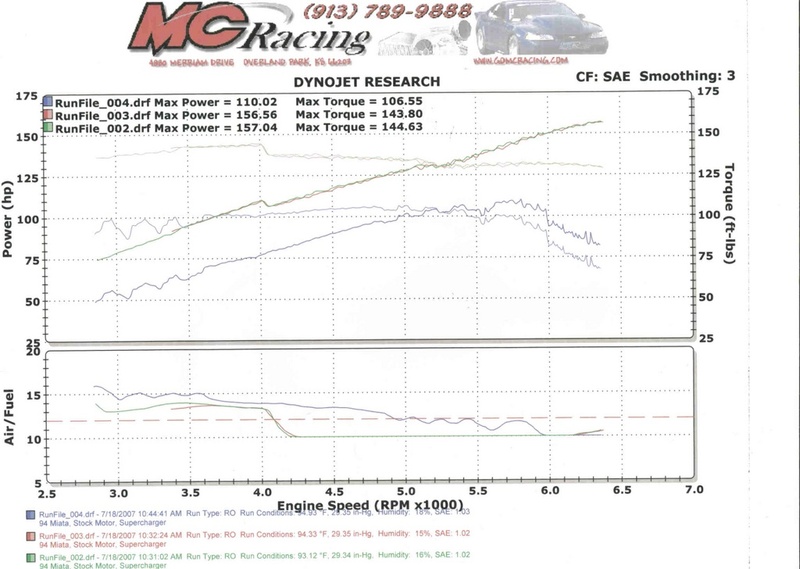 I have heard that simply replacing an AFPR with the JR powercard has resulted in very substantial gains as measured on a dyno. I mean going from 150 to 165 whp.. Since you already have the black box, your gains might be less dramatic, but they should still be significant. If you run larger injectors and the smaller pulley, you should see very noticeable improvements in your power. How much power are you making now? 01, m45, 150mm overlay pulley and 62.5 nose pulley, EMU, tdr intercooler, 2.5" exhaust. 8psi on cold mornings. 7 normally. hated it. pulled it and am now running a turbo. Oh, I did not read that in the thread. He was clearly making a lot of power already for an M45. I agree that if making a lot of power is the goal, turbochargers are the best way to go. It's very difficult if not impossible to upgrade blowers in the positive displacement systems. Just too cumbersome if if one finds the blower itself. No Silver92b, I am still running the supercharger. I plan on selling the car to start fresh on a new one with a turbo setup. I am not sure how much power I am making now, as I have never had the car dyno'd. That was the reason for creating the thread, to get a general idea. I have definitely noticed an increase in torque over the stock supercharger. I do not usually run my rpm's too high (I don't race), so I don't pay as much attention to hp. I can understand wanting to try a new thing. You can definitely get a lot more power easier with a turbo set up. However, it will cost you a pretty penny unless you are a DIY guy and buy everything at bargain prices. Take a look at the FM turbs kits and BEGI turbo kits and you'll get an idea of the cost vs power. The supercharger is not a bad bang for the buck even though people in this forum hate superchargers. I just recently moved to Statesboro, which is around 3 hours from Atlanta. That is where I have went in the past to get dyno's and some tuning done (different cars), Top Speed in particular. I have been driving this Miata for several years now with the supercharger, so I guess it is just that I have grown used to the thrill it gives. Back when I auto-crossed some, it was fantastic. But now that I am consumed with work and family, I am not able to enjoy like I used to. Turbo lag is more fun for daily driving imo. Well, good luck in your next stage . I think you'll have a lot of fun. Still, I'd get it on a dyno first and see what it does... It would be a shame to find that what you have now is a lot more cost effective... Do check out the price of the better turbo kits & the installation costs as well. Just to make sure, you know. i was just posting what my car made and the mods it had. was not trying to be confusing. I bought it supercharged, it was peppy, but I like the turbo setup much better. OK, I was confusing you and the OP. Of course since neither of you is running a SC and you are happy with your turbos, I think this thread is done and I really don't even understand why it was started in the first place. Sorry for taking up bandwidth. Quick Reply: M45 Hp and Tq estimates?